Time for more Mega Man X action! As the first game was a success, Capcom decided to release a sequel to Mega Man X. 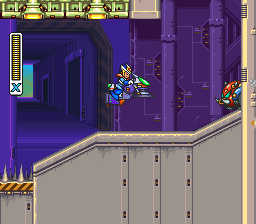 Similar to the previous game, Mega Man X2 for the SNES plays similar to the classic Mega Man games but with new features added. This time, the game has even more new features to make it more interesting and also uses more the power of the 16-bit console. The game resumes the story from the last one. Some time after the events of the first game, the Maverick Hunters recieve a threat from a group called the X Hunters. These mavericks claim that they have the body parts of Zero and challenge X to defeat them in order to recover them. At the same time, a maverick outbreak is happening again. So, as X, it's your job to once again stop this threat from causing destruction around the world. 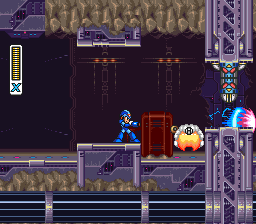 The game plays and feels pretty much the same as Mega Man X. All the controls feel pretty tight and responsive. The default buttong placements are the same and the button customization is back too. The only difference this time, though, is that you'll start with the dash right from the start. The game again places you on an opening stage that's designed to get you into the action while at the same time teaching you the basics of how the game is played. After this, you'll meet the classic stage select screen with the eight regular stages and their respective bosses to defeat. 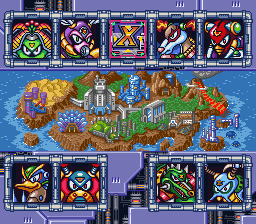 Like the previous entry, the game features nice level design and variety in the setting of the stages. The difficulty of the game is also on par with the previous game but with different challenges this time around. One big difference to note is that this time around the design of the stages always stays fixed. This is unfortanate as it was a feature that made the game's world more connected and altered the way you had to tackle certain stages depending on who you had beaten before. A cool thing of the game is that sometime during the progress of the game, the X-Hunters will decide to challenge you to battle if you want to recover the body parts of Zero. These will be optional extra boss battles that you can choose to tackle or not and will make an important difference later in the game. The heart and sub tanks also return once more as hidden secrets that you can get. They work exactly the same as before and also are quite useful in your journey. Besides that, the four armor upgrades are also back and this time give you different useful upgrades, like an air-dash. Another new thing in the game is that this time you can also ride a bike in certain levels. The bike's control is really basic and provides a good variety to the usual gameplay of the game. The Ride Armor is also back and better as it now has the ability to hover. Graphically, the game looks good and sharp. The sprites and backgrounds are well made so you can notice details easily. This time, though, Capcom has also used their own chip inside the game to make the game look even better, with certain bosses that are actually made in wireframe 3D and don't clash with rest of the game's graphics. The music of the game is excellent. One or two tracks may not be that good, but the soundtrack will definitely stay in your head. All the music matches the appropiate situation and sets you in the mood for the action of the stages. The sound effects work really well too. 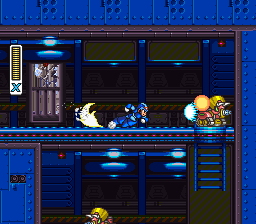 With Mega Man X2, Capcom has made a succesful sequel to the original Mega Man X. The game is highly recommended for everyone and a must have for both Mega Man fans and action game fans.